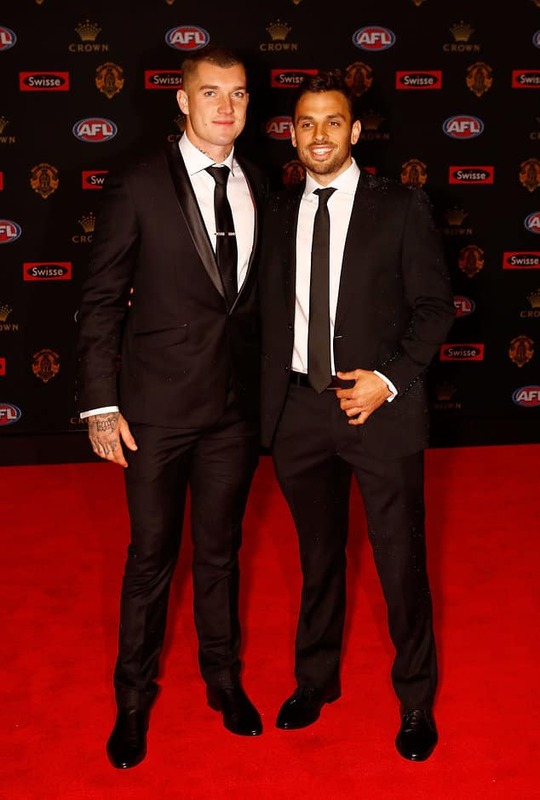 Dusty and Lloyd on the Red Carpet Dustin Martin and Sam Lloyd arrive at the 2016 Brownlow Medal. Dynamic midfielder Dustin Martin etched his name into the Richmond record books at the 2016 Brownlow Medal count. Martin became the first player in Tigerland’s history to poll 20-plus votes two years running. He finished third this year on 25 votes after being awarded 21 votes in 2015. In fact, Martin now is just one of three Tigers ever to poll 20-plus votes in the game’s most prestigious individual award more than once. Richmond ‘Immortal’ Kevin Bartlett did it twice, receiving 22 in 1974 and 45 in 1977, when both field umpires per match, at the time, cast votes. And the Tigers’ dual Brownlow Medallist, champion ruckman Roy Wright, managed the feat on three occasions – 21 votes in 1952 (his first Brownlow), 29 in 1954 (his second Brownlow) and 20 in 1957. Martin, this year, also equalled the Richmond record for polling Brownlow Medal votes in the most number of games in a season. He polled votes in 11 games this season, which is the same as what Bill Morris managed in 1948, when he won the Brownlow, Roy Wright, when he won his second Medal, in 1954, and Trent Cotchin, when he finished equal runner-up in 2012.